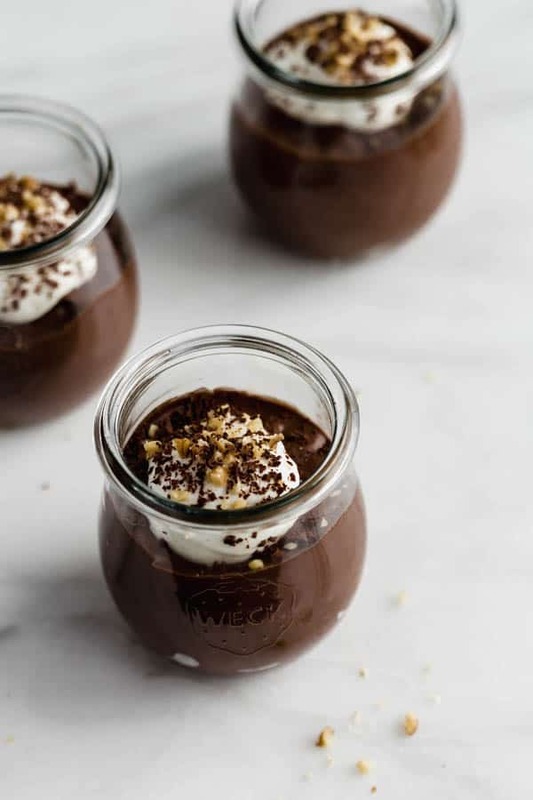 This vegan double chocolate chia mousse is loaded with rich chocolatey flavour and made with wholesome ingredients. You’ll love this decadent (but still rather healthy) dessert! Riddle: What do you get when you cross dark chocolate with some chia seeds with coconut milk? 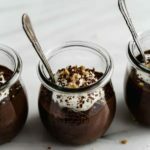 Vegan double chocolate chia mousse! Oh yessss where my chocolate lovers at!? *me raising both hands. * We are not playing around with this one my friends. This isn’t your typical chia pudding recipe. This is a rich fluffy decedent heavenly mousse. 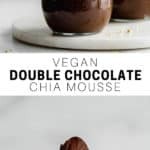 This vegan double chocolate chia mousse is made with simple and minimal ingredients but is anything but basic. It’s pretty much like chocolate heaven in a jar. It’s also completely dairy-free, made with coconut milk for a creamy mousse that anyone can enjoy! 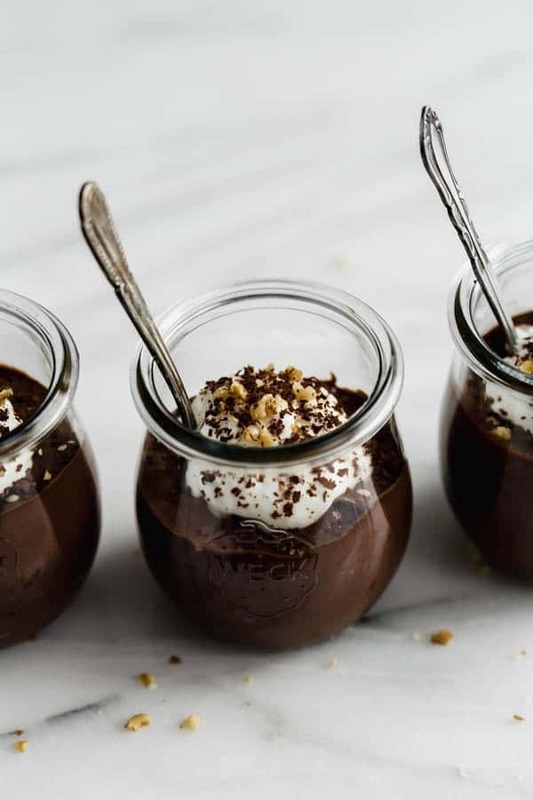 I love to keep some mini jars of this mousse stored in my fridge for the week (LOL ok, they last a day) for a treat thats still on the healthier side. 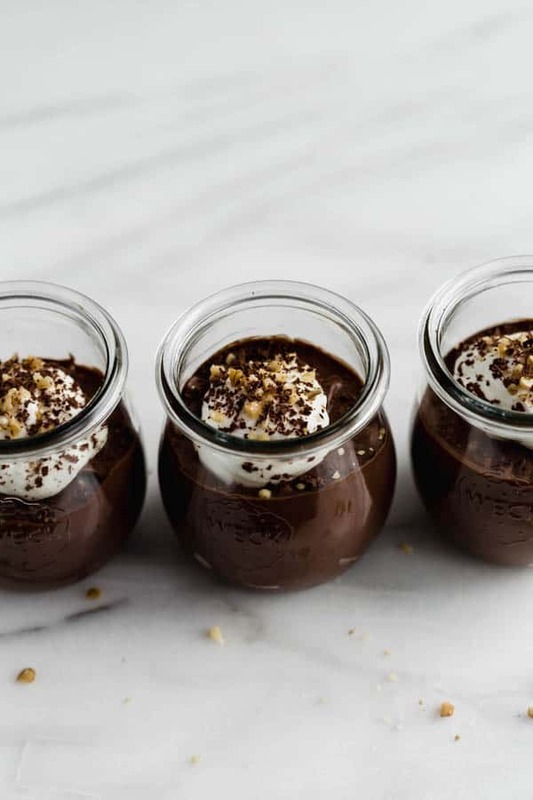 This chocolate mousse is sweetened with Medjool dates and a little maple syrup, and uses 70% dark chocolate for a rich chocolate taste. Chocolate mousse is made my mixing chocolate (duh) with some sort of creamy element. 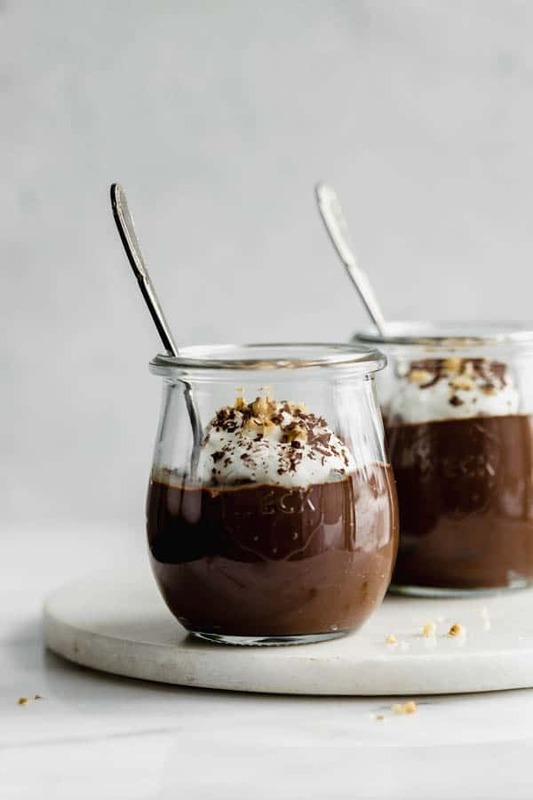 Traditionally, chocolate mousse is made with cream and eggs, (sometimes the yolks, and sometimes the whites) to result in a light fluffy mousse consistency. 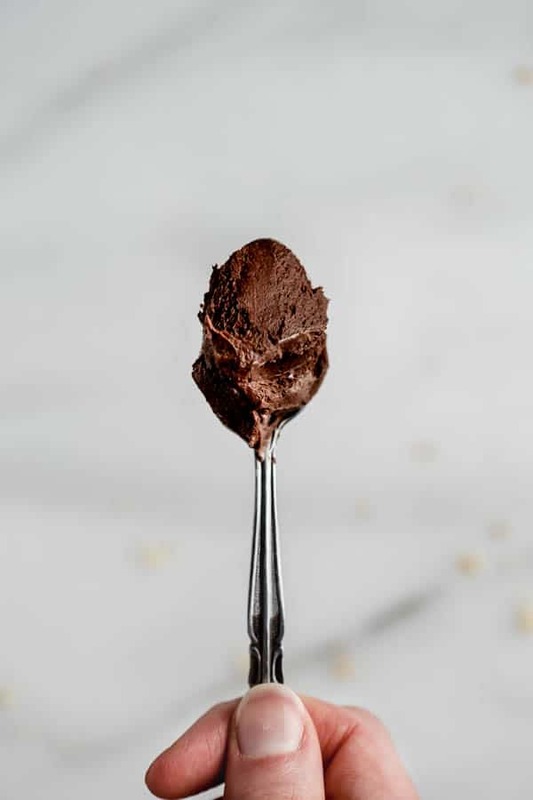 For this vegan double chocolate chia mousse, we’re using coconut cream and chia seeds to give us that same thick and creamy texture. Coconut cream has a high-fat content, so it works the same as regular cream would. All the mousse ingredients get mixed together and then go in the fridge to set before serving. Typically you’ll want to leave at least 1-2 hours for the mousse to chill before serving. This is also a great recipe to prepare the night before and let it sit to chill in the fridge overnight. This vegan double chocolate chia mousse is made with both dark chocolate chips AND cocoa powder so it has double the chocolatey goodness! Make sure to be using a high-quality dark chocolate and cocoa powder so you get a nice rich flavour. 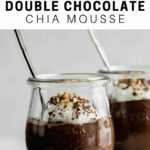 The chia seeds in this recipe get blended up in the mousse so it has a nice smooth consistency. If you do not have a powerful blender, you can also buy (at most grocery stores) ground chia seeds, which you can use in this recipe instead. This chocolate mousse can be modified to add in any flavours you like. Orange zest, mint extract or hazelnut butter would all be delicious additions! If you make this recipe a day in advance, let it sit on the countertop for 10 minutes before serving to soften, as it will firm up quite a bit if it’s in the fridge for a long time. I use whipped coconut cream! Made these the other day and they were SO good! This recipe is amazing. Just made it and wanted to eat the entire thing. I used coconut nectar instead of the maple syrup. Thank you so much for the recipe!!! hi I’d like to try this but not sure about the quantity of chocolate. how much would it be in grams or ounces? I struggle with cup measures as the amount in the cup would vary depending on the size of the chunks? Hi Louise, it would be about 90 grams of chocolate if you are using a bar!